Just within the fence on Cascabel Road I finally have to stop digging out an old T-post and go search out whatever critter is calling from the canyon and mesa to the east a long descending trill and chatter. I presume it’s a bird I’m unfamiliar with, who knows, something newly arrived from Mexico and, ahem, undocumented, now the climate of Sonora heads north inexorably. A wren? I have no idea what the Sinaloa Wren–a species new for the United States found the more frequently not much south of here–could sound like, and this voice certainly has a wren motif, or should that be a wriff? After scrambling through two sets of fences and into the rough hillside of Catclaw and Saguaros, I arrive near the source of the odd notes as best I can figure just when the hoot of a midday owl silences whatever it is, and I don’t hear it again. I ought to resist the drive to find out every last fact about this place. A White Tiger Moth comes over, slowly, passes on by. Twenty Javelina bring their babies to the cool and green winter #2 Pasture, and tuck into the vast salad bar. The balmy air of late afternoon is full of bugs dancing, on what elfin mission? They move in the orderly bounces of a pinball, or zigzag back and forth and back and forth … Phoebes chitter on the posts, then dive and sail into the shimmering horde, the birds’ moves telling me they can outwit and out maneuver any of these insects that know so well how to evade me. The day’s become so warm that it’s a pleasure to go back to work on the fence in the shade of the old and giant mesquite trees, where I’m somewhat camouflaged. I hope to hear the mystery trilling song again, from those slopes rising steeply on the other side of the road. While I dismantle the fence that Mycha the cow makes shortcake out of when she wants to get mesquite beans on the outside, there comes a huge Accipiter swirling and diving into the road but apparently missing its target. Gambel’s Quail in the sunset light behind me scatter, and purl excitedly as they flee the raptor even though they’re a thousand feet away from us. The hawk is big and brown, with the bright slash of a white eyebrow over the most intense of gazes, lands on an electric pole almost overhead of me: a Goshawk! Is it what had taken down the Cooper’s Hawk whose feathered remains were on the pasture a month ago? 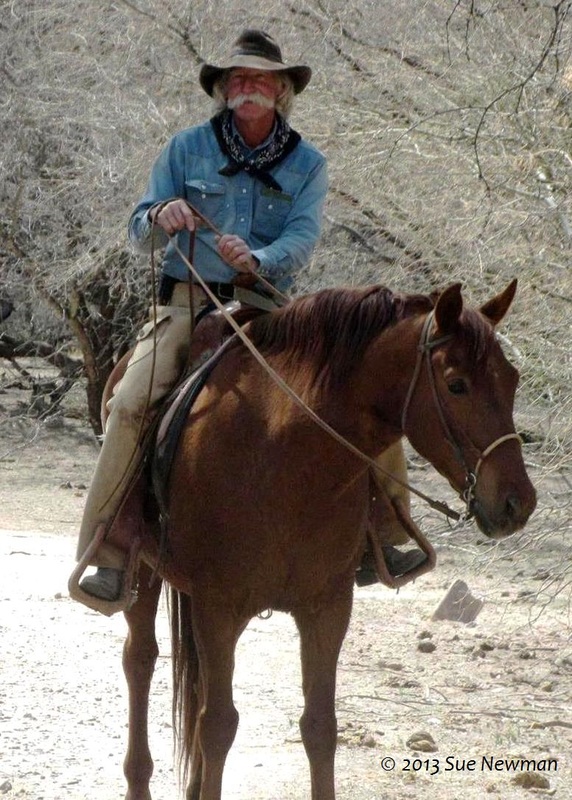 Woody Hume cares for the land and livestock in the Middle San Pedro River Valley of southern Arizona. Woody is a skilled naturalist and keen observer of the birds and wildlife that visit the pastures, stock pond, and mesquite bosque where he works. The Sweetwater Center shares excerpts from his writings as part of our work exploring links between conservation and agriculture. Woody uses the Tucson Audubon Society's book, Finding Birds in Southeast Arizona. Copyright Woody Hume 2013-2017. Unauthorized use, except for excerpts and links with credit given to Woody Hume, is prohibited. Woody and Loompy moving cattle. Photo, Sue Newman.